No Yes, 2 letters on the keeper/loop. Yes, 2 letters on the wide blade. Yes, 3 letters on the keeper/loop. Yes, 3 letters on the wide blade. Product information "Floral Printed Silk Bespoke Tie - Burgundy II"
You can also have your tie monogrammed, either on the end of the wide blade (on the back, of course) or on the keeper. You can tell us your desired initials during checkout (under “comments”). How to determine your ideal tie length: most people want their tie to end roughly at the middle of their belt buckle with both ends of equal length. So just take a tie, wear it with your preferred pants (rise is obviously important), shirt and tie knot and see where it lands when you tie both ends the same length. If the tie is now, for example, 3cm longer than you like you will need a tie that is 6cm shorter than usual. Our standard tie length is 147cm. 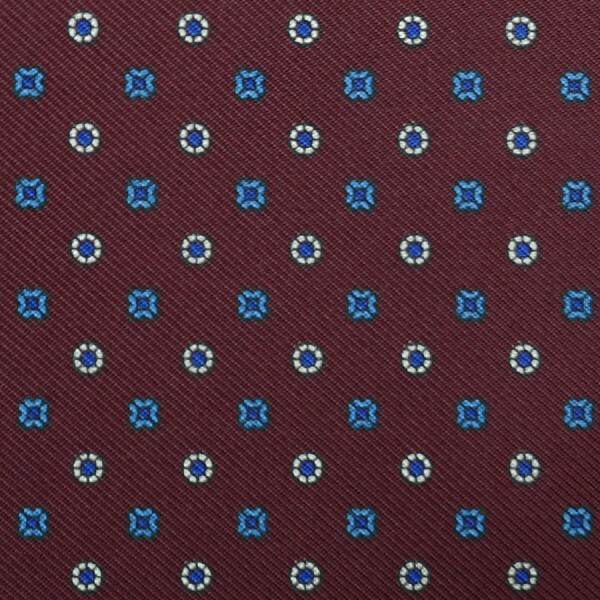 Related links to "Floral Printed Silk Bespoke Tie - Burgundy II"